Dvd - supernatural - full seasons 1 to 12 - jared padalecki, jensen ackles. Description of productsupernatural - full seasons 1 to 12 contains: - "supernatural - season 1" - "supernatural - season 2" - "supernatural - season 3" - "supernatural - season 4" - "supernatural - season 5" - "supernatural - season 6 "-" supernatural - season 7 "-" supernatural - season 8 "-" supernatural - season 9 "-" supernatural - season 10 "-" supernatural - season 11 "-" supernatural - season 12 "synopsis two brothers roam the states - united to hunt down the evil forces responsible for the death of their mother, twenty years earlier ... Actors: jared padalecki, jensen ackles, sarah shahi, palicki adrianne, samantha smithformat: palaudio: italian (dolby digital 2.0), german (dolby digital 2.0), English (dolby digital 2.0), English (dolby digital 5.1), French (dolby digital 2.0),ish (dolby digital 2.0) subtitles: Norwegian, English, Dutch, French, German, Swedish, Finnish , italian, castilian,ish, danish, portuguese region: region 2 this dvd will not be able pro can not be visualized outside Europe. Number of discs: 71studio: warner bros. Release date of DVD: May 3, 2018. 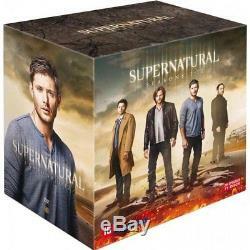 Product Description supernatural - full seasons 1 to 12 contains: - "supernatural - season 1" - "supernatural - season 2" - "supernatural - season 3" - "supernatural - season 4" - "supernatural - season 5" - "supernatural - season 6" - "supernatural - season 7" - "supernatural - season 8" - "supernatural - season 9" - "supernatural - season 10" - "supernatural - season 11" - "supernatural - season 12" synopsis Two brothers travel the US to hunt down the evil forces responsible for the death of their mother, twenty years earlier ... Actors: jared padalecki, jensen ackles, sarah shahi, adrianne palicki, samantha smith format: pal audio: italian (dolby digital 2.0), german (dolby digital 2.0), english (dolby digital 2.0), english (dolby digital 5.1), french (dolby digital 2.0),ish (dolby digital 2.0) subtitles : Norwegian, English, Dutch, French, German, Swedish, Finnish, Italian, Castilian,ish, Danish, Portuguese is region: region 2 this dvd will probably not be able to be viewed outside of europe. Number of discs: 71 studio: warner bros. We do not deliver post boxes or military bases, thank you to take into account when ordering. Followed letter - 0.00. Post - international economic mail - 7.90. For more information on delivery, click on more info. Sorry, our products are not available for withdrawal in store. On request, we offer the possibility to pay by bank transfer. No checks will be accepted. The law n 81-766 of August 10, 1981 relative to the price of the book, known as law lang (of the name of jack lang, minister of the culture), is a law establishing a unique price of the book in France. Ask the seller a question. Manga - academy alice (the) vol. Manga - princess sakura vol. Manga - nijika, dream actress, tome 3. Manga - nijika, dream actress, tome 5. To contact the customer service, simply click on the button and we will be happy to assist you. Delivery is free for this item (metropolitan France only). Upon request, we accept payment by transfer. The object must be returned within 14 days after receipt. books will not be resumed if they show traces folds, pages cornea, writing .. the item "dvd supernatural integral seasons 1 to 12 jared padalecki, jensen ackles" is on sale since Wednesday, July 4, 2018. It is in the category "dvd, cinema \ dvd, blu ray ". The seller is "around_the_clock" and is located in /leans.